Sunlight can’t enter a room full of furniture, similarly, we need more spaces sometimes to light up our hearts. 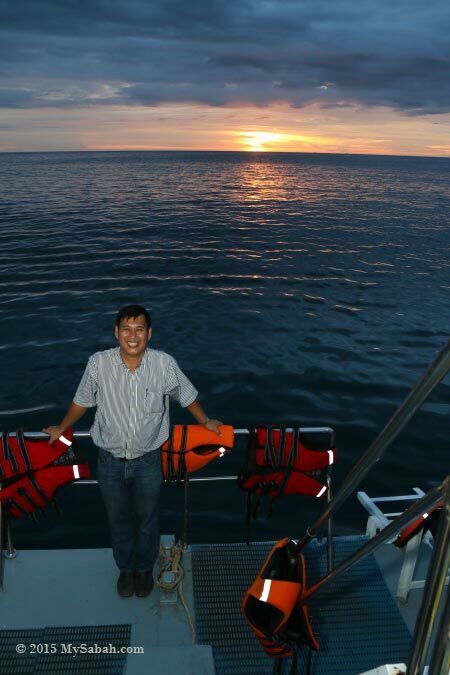 That’s why I like the sense of freedom in sunset cruise. 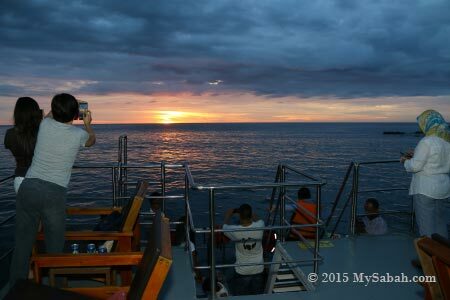 The feeling of watching sunset from the vast open sea is very different. On the land, sunset is only a nice background to mark the end of day. On the ocean, you are like an audience standing on the stage of sunset for its magic moment. 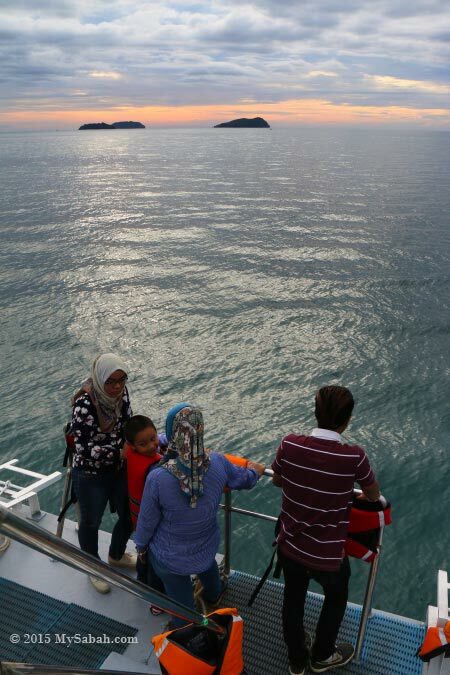 Kota Kinabalu City (KK) has nice sunset and our beautiful islands are just a few Kilometers away, so all we need is a boat for the trip. 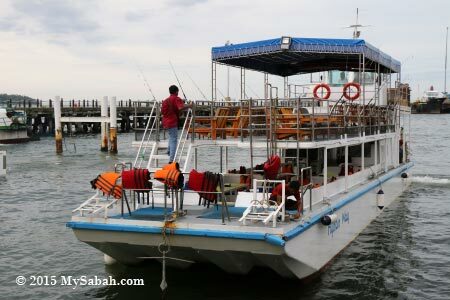 For the New Year Sunset Cruise Gathering, Sabah Wetlands Conservation Society chartered a cruise boat which could accommodate up to 50 people. Hydian Way looks like a double-decker bus of the sea. 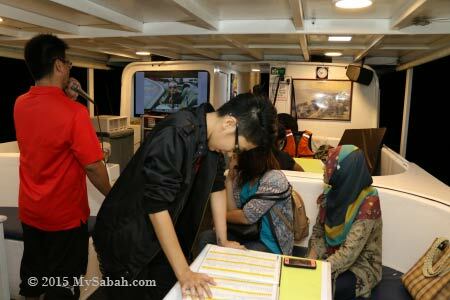 It’s a 60-feet passengers cruise boat designed for short distance tour cruise. 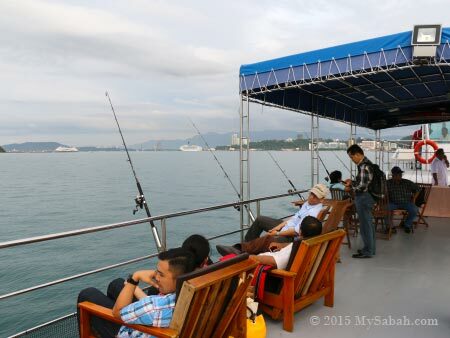 The lower and upper decks are flat surface with many chairs and tables, so passengers can carry out any activity and enjoy open view of the sea, exactly what we need for a leisure ride. Most area is sheltered from rain and hot sun, another plus. Pic: lower and upper decks of Hydian Way. The toilet and bathroom are at the rear of lower deck. 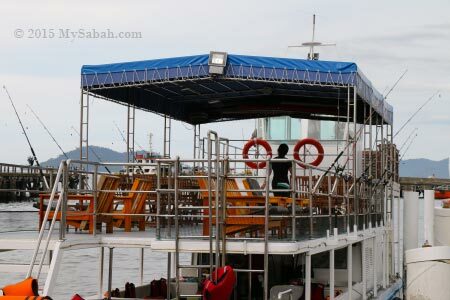 We departed around 5pm from Jesselton Point Ferry Terminal and headed to the sea and islands of Tunku Abdul Rahman Park. 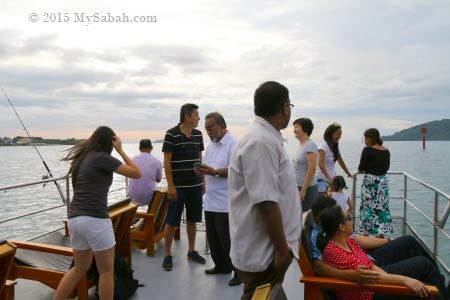 Everyone was so excited onboard, we explored around as this was our first time experience on sunset cruise. The boat has an area of 1,500 square feet. Most seemed to like upper deck better, where we could see the surrounding on higher vantage point and enjoyed the sea breeze. 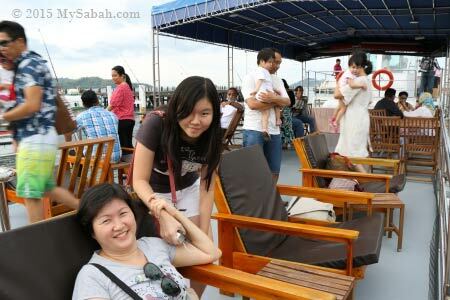 Lower deck is more stable and suitable for those who are prone to seasick. 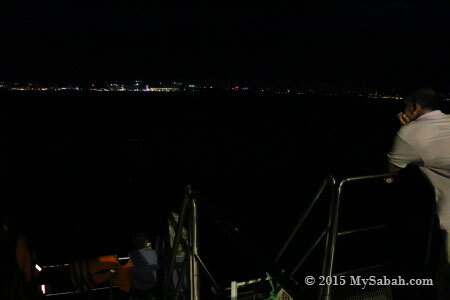 Anyway, the swaying motion wasn’t strong when the boat was moving. I also walked around to find the best viewpoint. 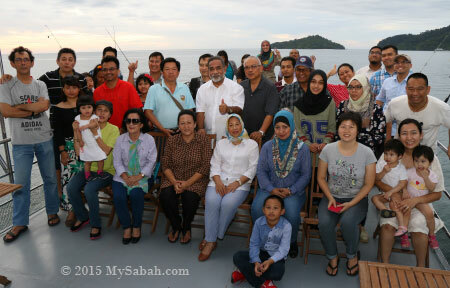 After a while, everyone was settling down and started their romantic or family time. 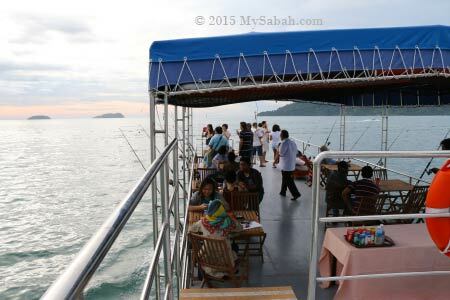 Pic: our boat leaving KK and head to the sun! 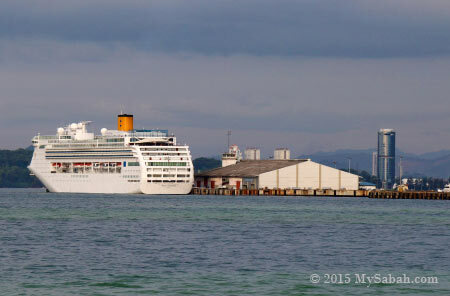 Pic: a cruise ship in Sabah Port. I wonder how it feels to see sunset from that huge ship. It had been raining in past few days, we didn’t know if the sunset view would be nice. The sky was cloudy, so I didn’t expect a spectacular sunset. As long as it didn’t rain, I was happy. 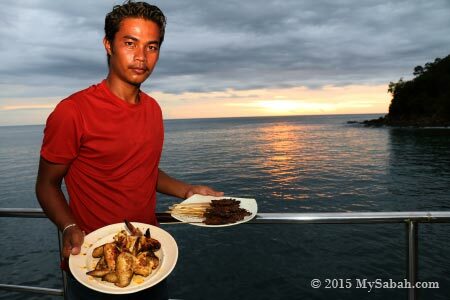 Even if the sunset wasn’t nice, we still had nice food onboard. Yeah, check out that BBQ lamb, it’s the one of the highlight man. Everyone’s spirit is high. 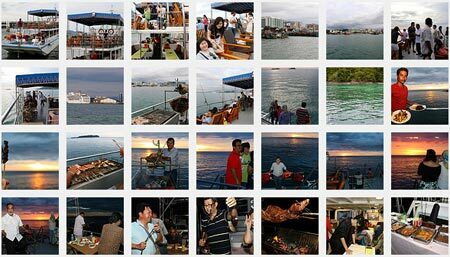 For company annual dinner, you may consider organizing a sunset cruise party. Conventional dinner in hotel is just boring and everyone wants to leave after meal. Pic: the sunset is about to start. When the sun moved closer to the horizon, the sea water turned into silvery blue, an interesting color that only can be seen from open sea. 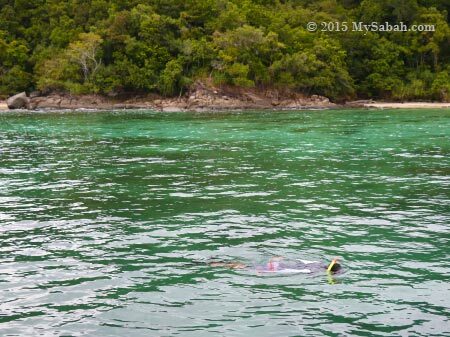 Then the boat brought us behind Sapi Island, where we could snorkel (snorkelling gears provided onboard). It was a bit cool probably due to the recent rainy season, so only one person doing it. 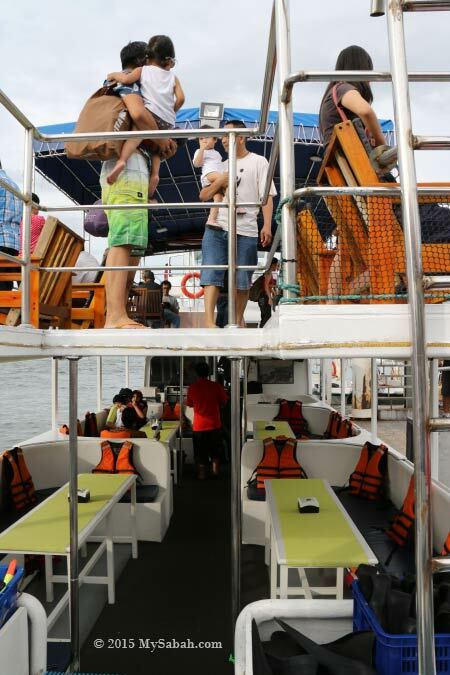 Just to let you know that you can have this activity, and the boat can take you to snorkelling spot far away from crowded tourist area. If it was a hot day, I would take a swim. 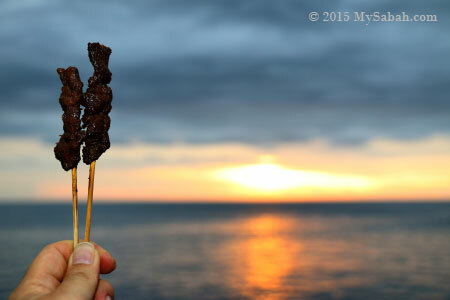 Our barbecue chicken wings and satay were ready, just in time for the sunset. With free flow of soft drink, it couldn’t be better. 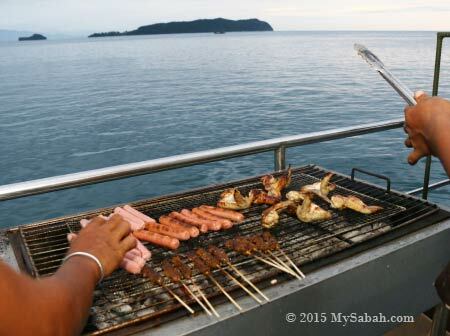 Pic: satay for the sunset! Pic: more BBQ food. Wish you were there. 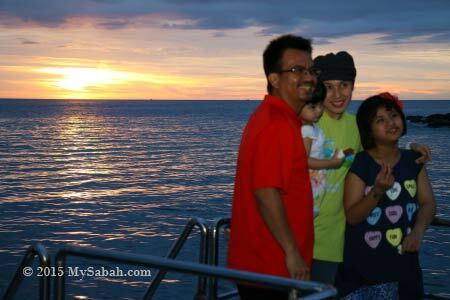 We were so happy about the exceptional view of sunset. 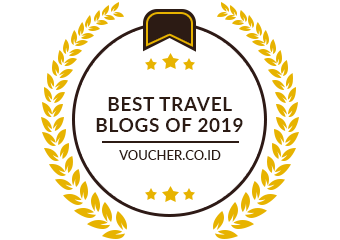 In fact, we thought of postponing the trip because of the possible bad weather, now we have no regret. Alex, the owner of the boat, was happy too. 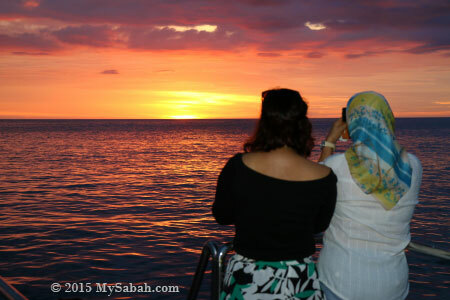 We were the only group on the open sea that day, this sunset view was exclusively for us. We were busy taking and posting sunset photos to our Facebook. Some even updated their profile photos with sunset as background. Bet these photos got many likes and made their friends envious. Pic: the magic moment with the most intense colors, cloud and sea were painted with rosy colors but only lasted a few minutes. 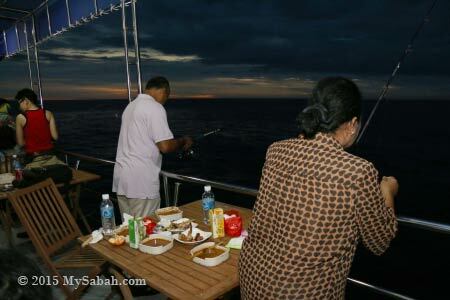 After the sunset was over, our boat moved further and anchored in open sea for next activity, fishing. The crews had prepared fishing rods and bait for us. We caught a few snapper and grouper. 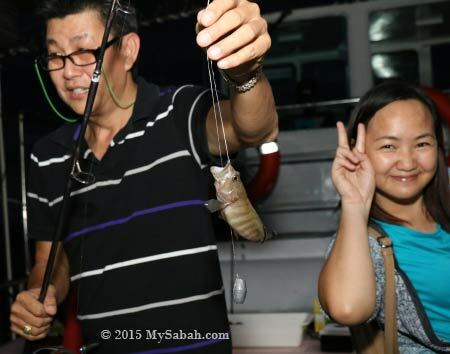 However, the fishes were too small, so we released them back into the sea after photo taking. 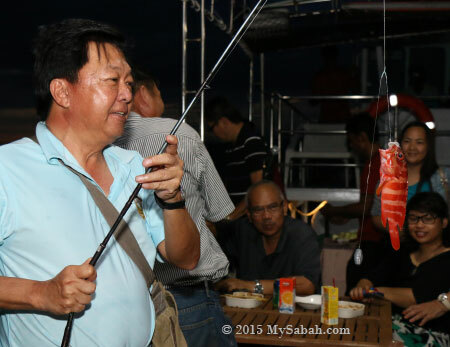 If we were lucky, we would have BBQ fishes. 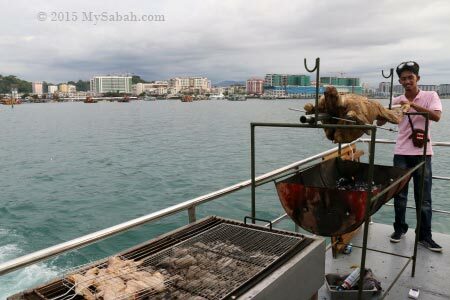 Though we have no BBQ fish, there’s something better waiting for us. Our BBQ lamb is ready. We started second round of feasting. 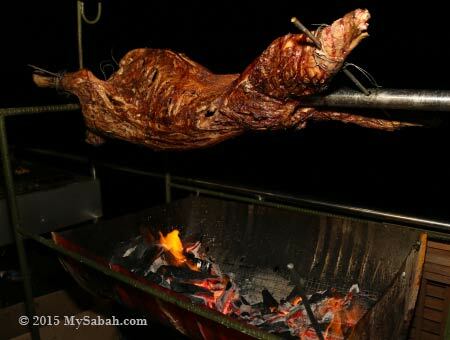 The lamb was roasted slowly, so the meat was kept juicy inside, very yummy. 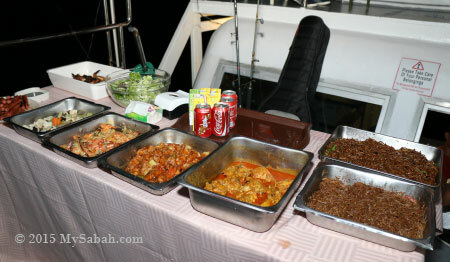 For buffet dinner, we also had fried noodles, curry chicken, butter prawns, mixed vegetables, salad and sweet & sour fish. The BBQ just now was more like high tea lol. Our eyes and mouth were satisfied, next it’s the turn for our ears. Let’s have some music. The boat has karaoke set in lower deck, so you can show your talent. Your voice will be broadcast to upper deck too, so nobody could escape from your performance, unless they jump into the sea. Sing as loud as you can, because there no neighbour will complain you. We had fun until 8:30pm, then we had to go home at last. 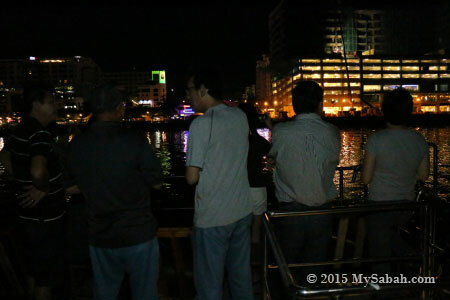 Watching night view of KK city is the last part of our trip. 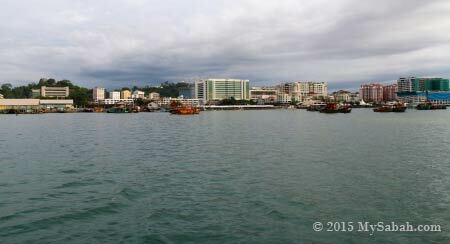 The bustling KK looks like a sleepy city from a distance. 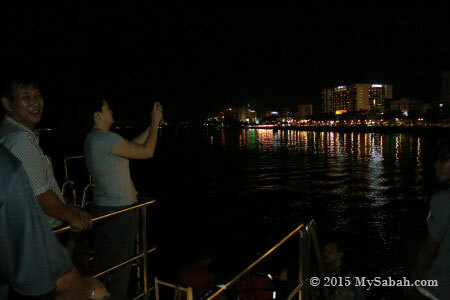 Instead of heading straight to the port, our boat cruised slowly along the shoreline of KK, to have closer look of KK city night. 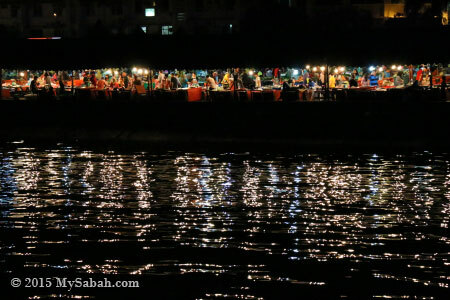 To be honest, though lovely, the night view of KK is not as magnificent as big cities. Anyway, I don’t see this every day, so I still enjoy the moment. 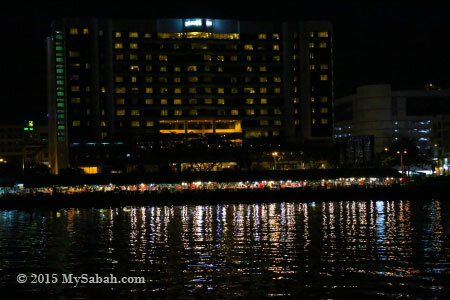 Pic: Le Meridien Hotel and Sinsuran Night Market are the brightest section of the KK night view. Pic: Sinsuran Night Market with busy hawkers and customers. Guess they didn’t know they were being watched. 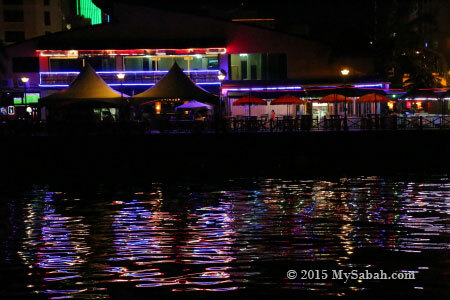 Pic: KK Waterfront Esplanade won my award as the most colorful night view of KK, haha. Overall, this is a delightful trip and a luxury to me, who spend most of my time living and working in a world as small as an office cubicle and bedroom. I bet you will enjoy such tour. You can either join a tour or organize a party yourselves. The following are the packages and prices for tours by Hydian Way (as of Jan 2015). You can download their brochure for full details. Address: Ground Floor, Premier Golf Center, Jalan Istiadat, Kompleks Sukan Likas, 88400 Kota Kinabalu, Sabah, Malaysia.